Fiona Harrison is a hugely talented Classical Guitarist who teaches, performs and collaborates. Fiona has a wealth of amazing credentials, she is a graduate of The Royal School of Music, has a masters degree from Yale and has won glowing praise from top publications such as Classical Guitar. It was really important that Fiona replaced her tired and old fashioned website with a brand new digital presence. As well as being a accomplished musician Fiona teaches students locally and online so information about her classes and workshops needs to be easily accessible through the site. Fiona came to OH Creative enthusiastic to collaborate and it was a real joy working with her. 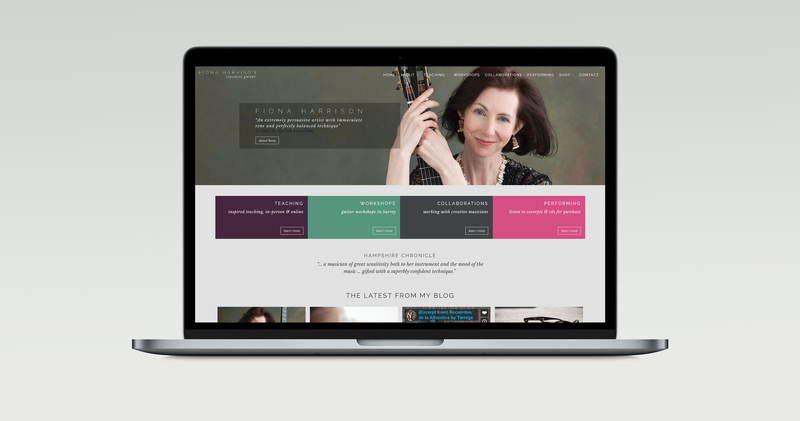 Fiona may play Classical Guitar but that didn’t mean that she wanted a stuffy branding or website. In fact, she was in total agreement with us that the feel for her design should be elegant, but warm and welcoming. We used a combination for a classic serif font with a super-modern san serif across all elements, a visual indication of Fiona’s musical ethos. Fiona’s old website was very basic and no longer suitable for modern browsing across a range of devices. We needed to create a web design that works hard on a number of fronts. Firstly, Fiona has a number of strings to her bow so signposting to various landing pages was important. Potential students needed a clear path to teaching information, potential collaborators would like to see previous work and there is even a shop to purchase Fiona’s CD’s. Our confident, polished colour scheme helps to define pages with lots of information and encourages plenty of exploration.